Few countries have ingrained themselves into modern social consciousness in the way Cuba has. Fidel Castro; Bay of Pigs; The Cuban Missile Crisis; Cigars; Rum; and the inimitable Ernest Che Guevara. A bright spotlight, for such a relatively small country with little significant effect on other nations, and all recent history; all packed, impressively, within the last 70 or so years. Cuba is a plucky beast. Tugged mercilessly around by the Spanish and Americans and, for a short stint, the British. It took the belief and bravery of Castro and Che to provide the island with the identity it has now. Whether you like and/or agree with that identity, its impossible to deny the belief, guile and bravery of the men that got it there. Modern folklore, slung guns, iconic beards and army fatigues. All the history is relevant; and to now, not some bygone era. Every facet of the political turmoil is screen printed on the fabric of Cuban society, played out with bustle and noise in front of you. We pass propaganda billboards, squat concrete municipal buildings, pressing crowds formed outside stores with rumours of bread being available that day. As a kid, I marvelled at stories of Russians queuing to buy potatoes. Now we are seeing it. Live. In a country that has been a tourist beach destination for for some time. It is, quite frankly, ridiculous. The Cuba of salsa outbreaks and relaxed rum drinking is there, but the tourist brochures pressing that tunnel vision are bordering on fake news. It’s no surprise that boxing is the second favourite sport amongst Cubans; they are fighters and they need to be, but their opponent is life, commerce, food. Socialism is in the red corner. Cuba’s economy is the interesting talking point. 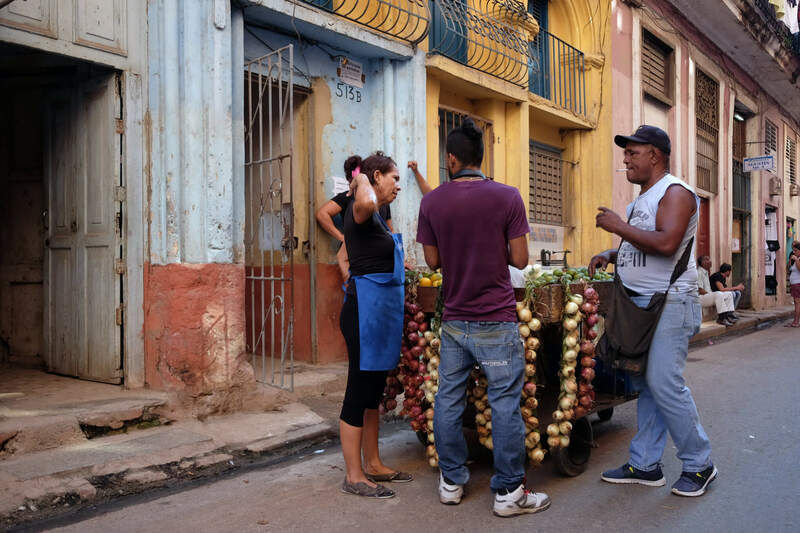 We book a walking tour with an Economist, a tour touted to give us an insight into Havana’s economic vagaries. Much is made of ‘The Search’. 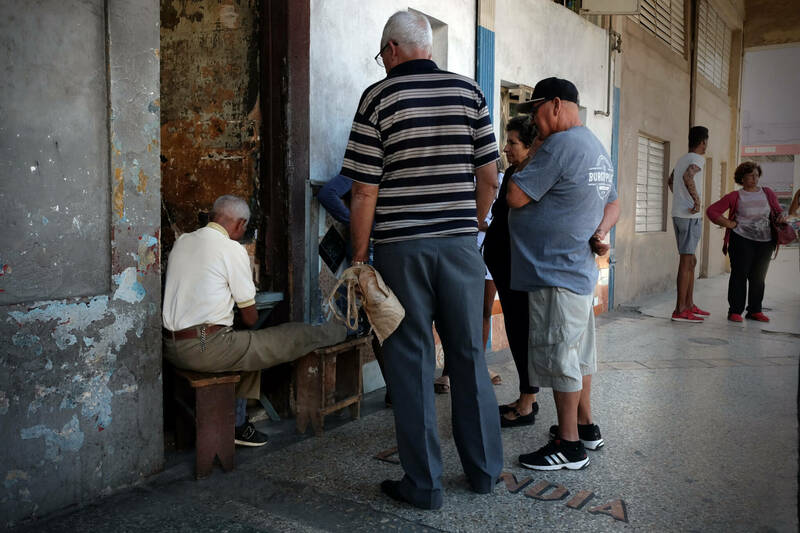 The means by which Cuba’s communist workers, paid $25 to $30 USD a month, can actually make ends meet. An intricate web of under-the-counter dealings known to the authorities but, a blind eye turned, a necessity for survival. A factory worker, part of a team with the delivery guy and stocktaker, skimming a small amount of product towards their distribution network; home businesses that are barely disguising the contraband that gives them enough food on the table keep hunger at bay. It’s fascinating. We end up in the small apartment of the tour guide’s Grandmother. A lady who makes croquettes and also tailors clothing to bodies it might not otherwise fit. Cubans are surprisingly fashion conscious and this tailoring helps them look pretty fly given the lack of couture opportunities. The grandmother reminisces, as she pours shot glasses of cheap and clear Havana Club. In her earlier years the crumbling tower block she lived in was condemned. Residents were moved to a shelter. Hundreds of people, warehouse style. No walls. No privacy. She was there for twenty years before being provided with alternate accommodation. Twenty years of adult life spent living in a dormitory. Suddenly her humble apartment seems like a palace. 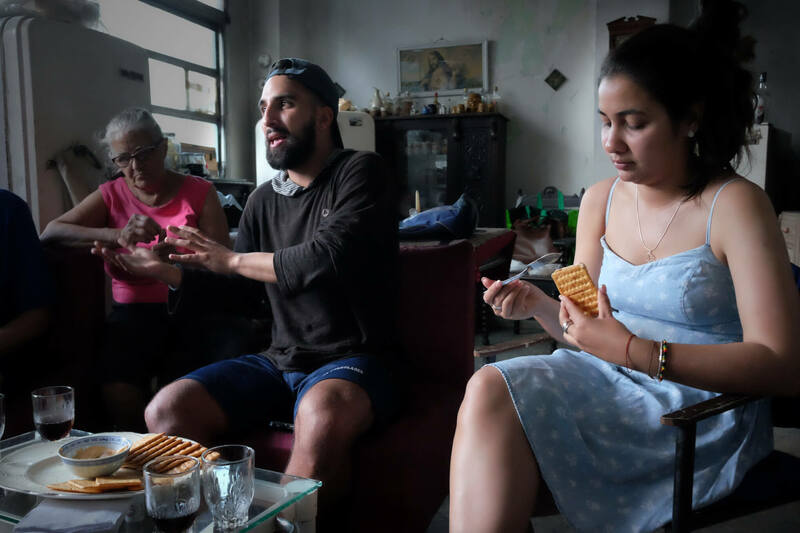 Society splits itself into three in Cuba’s capital. To the east, Old Town’s glistening runway chic is simply a Disney Cuba rolled out for cruise ship visitors. 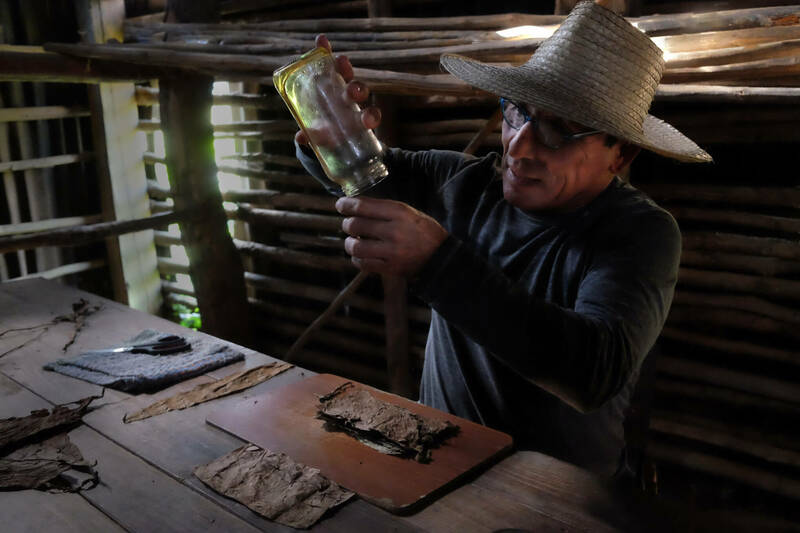 Their brief stop in a polished port punctuated by overpriced food in polished stone and ‘just like home’ boutique restaurants; ironically purchaseing Che Guevara paraphernalia, the ubiquitous silhouette of Che adorning everything from tea towels to mugs. The face of socialism a pulsing artery in Cuba’s capitalism. To the west is Vedado, a previously well to-do area in the hills. Mansions repurposed and crumbling house a spreading population. Classic architecture, finely detailed, held together with wooden boards. First floor bedroom verandas overlooking the harbour have had their archways blindly bricked to create an extra room, the cinder block forming an aggressive grey grid between the faded colonial pastels. In the middle is Cuba. Havana Centro. We discover the real Havana on our first day. Havana Centro. The gritty and stained heart of the city, free of pretension and almost all modern day trappings. The skin is darker here, there is more noise. Dominos clack against wooden tables supported by the knees of the players as they verbally jab and dig at each other in friendly banter, a half rinsed bottle of rum doing the rounds, fuelling the debate. A bright white smile calls me over, indicating I could sit down and play. His name is Ramon, he is surprised to hear I don’t play dominoes, a Cubans view of the world outside Cuba blunted by the lack of any news worth reading and an internet service based on line ups, scratch cards and small plaza based WiFi hot spots. I wonder whether I am a ‘mark’, a gullible sheep encouraged to play dominos for a little money and fleeced accordingly. But they are playing for bottle tops and the invite is genuine. The others don’t look up from their game so we shake hands and I head down the decaying street. Nowhere is the term ‘faded glory’ more applicable than this communist island. At some point in the recent past gloriously sculpted residences wrapped with delicate stonework and wonderful balustrades were whipped from the pockets of the wealthy, became government owned and shared with a plethora of more needy citizens. The buildings in Centro are tall, stained black and cracked. The exteriors littered with broken shutters, washing lines and people lowering bags from the uppers floors to people below to avoid the three or four flights of stairs. Kids play noisily in the street with half inflated footballs that would be landfill fodder anywhere else. This is the set of Bladerunner, re-imagined for 1950. Centro is a visual picture that in any other city would spell hassle. But despite being in the most run down area of the island we feel immensely safe. To quote Brett Easton Ellis (Glamorama) ‘We all slide down the surface of things’. The context may be different but it works. As we walk the streets we feel like spectators. You are never part of the deal. 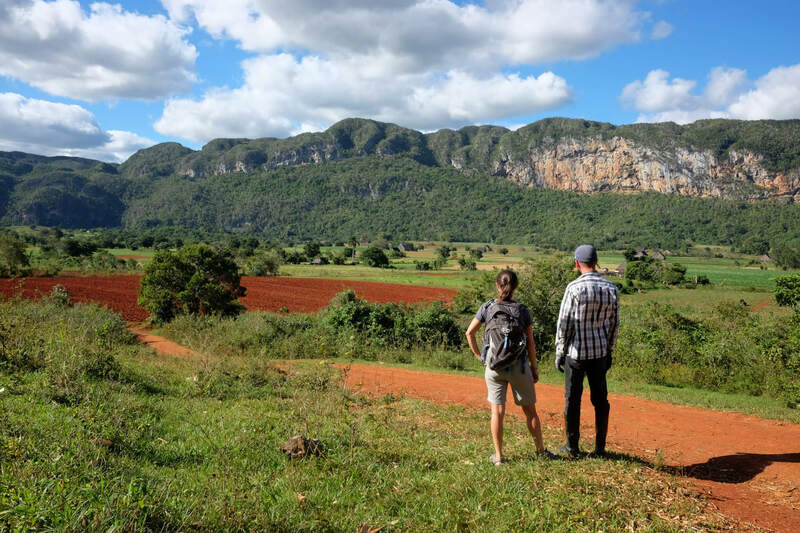 The feeling of safety is, in part, because non-cubans outside of the tourism bubble barely register with Cubans, you merely slide down the surface of their strange world. We reach a crossroads, tired of walking the streets. Google Maps unfairly intimating distances to be shorter than they actually are. Taxi?s are never far away and we reach the kerb, waiting for a huge steel slab of American to sweep past. Old American vehicles are everywhere. Brought over by the mob and friends in the forties and fifties, left behind when they departed and kept just about roadworthy for the last 70 years thanks to Cuban ingenuity and a little luck. None of them are original. Opening an engine bay on a ?58 Bel Air could reveal the shame of a transplanted Lada engine. The interiors have clung to the essential parts – seats, steering wheel, pedals, a windscreen. The rest has decayed or broken, money on replacements funnelled to necessity; those items needed to seat people and make the car move. Within seconds a taxi arrives. Its blue paint reaching a record thickness thanks to a fourth or fifth coat and thicker still thanks to years of dings and badly applied filler. The shark fin rear wings and rocket ship brake lights are simply wonderful designs, today’s modern mass produced vehicles a terrible devolution by comparison. The tan driver has his arm fixed at a right angle, elbow out of the window. A crisp shirt revealing some cool ink on his arm. Taxis are expensive but the price is ok and we get in, sliding along the piano panels of the black and white bench seats, gawping at the holes in the floor and the lack off roof liner; the chunky Art Deco dashboard and the retro dials, none of which have moving needles. It’s old, half ruined but effortlessly cool. 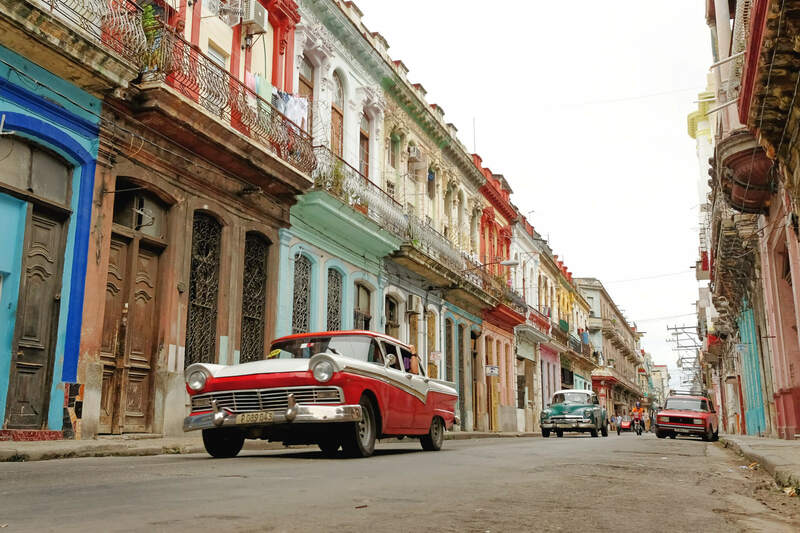 In searching for a Cuban highlight, cars are a close second to Havana Centro. People always win out. Prior to arrival I imagined seeking out these colourful old road going seniors, planning an afternoon where – camera in hand – I would get my fix of vintage. But they are everywhere. All colours, shapes and sizes, from mob style dual rear wheel vans to, rarely, open top Cadillacs with beautiful coachwork, restored to give tourists a top down tour of the city. They are so ubiquitous they fade from your consciousness, tattered exteriors blending seamlessly with the conditions of the buildings we cruise beside. Outside of Havana towns scatter themselves along the main highways,; roads wonderfully free of traffic with three empty lanes laid into the distance. 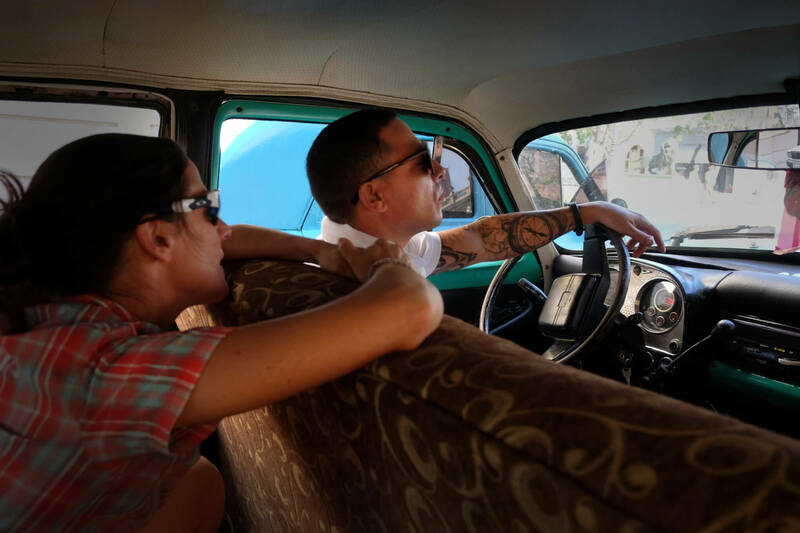 Over two weeks we dial in our Cuba skills, moving through the ranks of bus to taxi to collectivo, the price coming down as we go. We are shipped between one okay town and another. Pretty enough, some of the building exceptionally so. But months spent in Mexico has not levelled the playing field and we ache for the Mexican lifestyle, people, food. The general ease of living that Mexico so graciously extends. Away from the capital we lose the grit. Small pastel buildings are quaint but we’re bored. There is little depth. The people are simply not that willing to engage in any way. Maybe wary of outsiders given their history. The towns are shells. The food is generally poor. One plaza like the next. 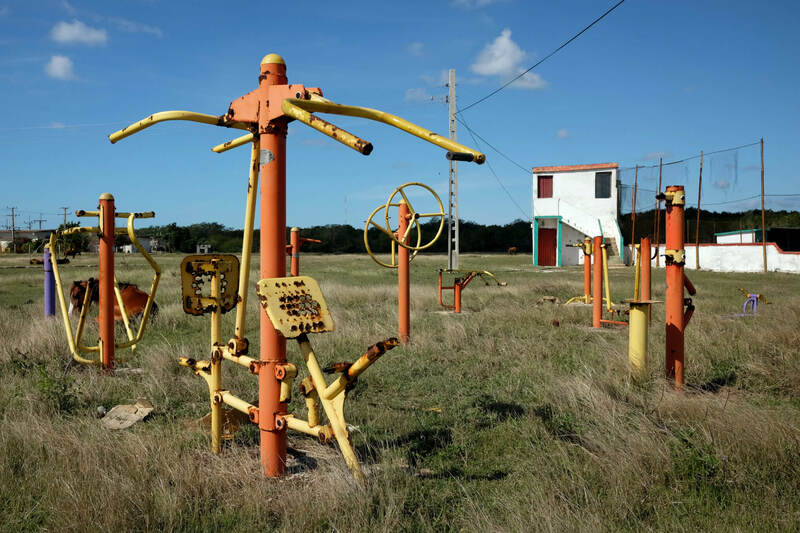 In the last couple of years Cuba has opened it’s arms a little wider to the tourist industry, and it shows. Some privatization has been allowed and, for a country that has reins of commerce held securely under lock and key, this has become a significant focal point. Strange icons noting Casa Particulares (private Bed & Breakfasts) are everywhere. Nowhere is this tourism fervour more evident than the once sleepy Vi?ales. Two main streets running through a lush valley surrounded by limestone cliffs. Tobacco fields blanket the valley floor, the farms harvest sent to the government who return 10% of the value to the farmer. The countryside is caught in time, epically beautiful. In contrast the main streets have become ?all tourist?. There is nothing for Cubans here. Every single home front is now a Casa Particulares, every store front catering to a medium wealthy tourist market. Playa Giron is our final destination. A sleepy seaside town that once saw a US instigated invasion get picked apart by the forewarned Castro. Castro vs US. David vs Goliath. The museum of this ‘Bay of Pigs’ victory is surprisingly small given the achievement. During the taxi ride to Playa Giron a horror flick is unfolding through the big screen. Our supporting roles suffering the suspense of near death experience while the lead actor, a balding friendly pitbull of a man, wields his ageing compact Hyundai with increasing aggression the closer we get to our destination. Summit fever. The assumption being that if we survived this far then luck is on our side and the needle should therefore edge further towards 110kmh. It’s a speed our ill maintained vehicle has no hope of safely achieving, but achievement rather then safety seems to be the goal. The final credits roll as we pull over outside our chosen B&B, the driver jumping out in the hope he can convince the casa owner our arrival at their business was his instigation and a finder’s fee should be supplied. His ‘Search’, I guess. By now we are counting down the days until we can return to Mexico. Time is filled with a dive trip. We are Advanced PADI certified divers but got bored with the underwater world some time ago and rarely go anymore. This dive was no real exception, good visibility, so-so coral and some fish. Two things worth spotting as they made their way gracefully along the sea bottom were Luke and Bethan, an Australian couple who were struggling to enjoy Cuba as much as we were. Misery loves company and we spend an afternoon eating terrible microwaved pizza from a bus station, verbally picking apart the various wonders of the island, its intricacies and its fascinations. It’s not often you can comfortably talk with strangers for hours on end but they’re great people, and we do. As Aussies they’re the closest cultural ally to Brits by some margin. The humour, sarcasm, social makeup. If only they would give up on Vegemite. They join us for dinner at our Casa Particulares. Having spent almost two weeks with bland, overpriced and not all that available food choices we have a great meal, including the best lobster we’ve ever eaten. No bread, no eggs, epic lobster. Welcome to Cuba.